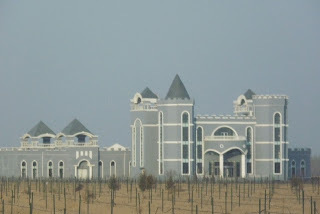 (Dec. 2013) - This winery is massive and very impressive as you approach and see the tall stone walls designed in the traditional Chinese fortress style of the region. 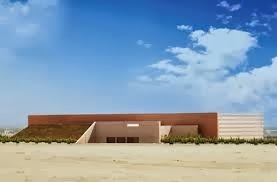 It includes pathways paved in native stone and breath-taking art sculptures designed of wood and petrified rock. The owner is a very gracious Chinese woman who has hired a French winemaker from Bordeaux to produce some excellent local cabernet sauvignon. Production is around 150,000 bottles (12,500 cases). The winemaking facility is state of the art, with new stainless steel fermenters, and top of the line basket press. 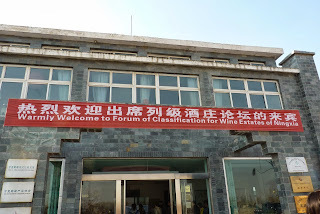 Hundreds of French oak barrels line the long cellars, and plaques proclaiming their wine awards in Chinese wine competitions decorate the walls. The winery is so fancy that it reminds me of tours through some of the top French chateaux. As we pass through the barrel room we are asked to sign a barrel – a custom they use for visiting dignitaries. They point out signatures from other famous visitors, and we are made to feel important to participate as many photographers take photos of us signing the barrels. We end in a tasting room with a very long magnificent wooden table with a strip of the local soil running through the middle of it to showcase the unique sandy rocky quality of the local terroir. 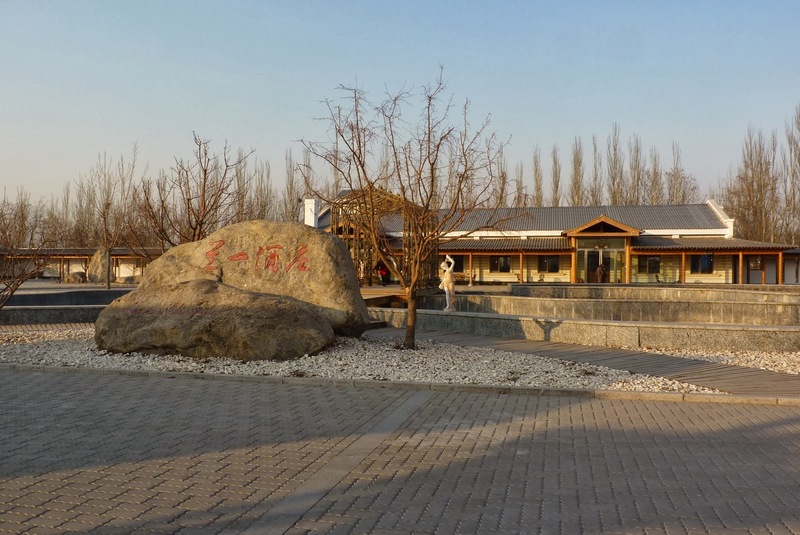 We taste the 2010 Chateau Yuanshi Cabernet Sauvignon, which is quite enjoyable. It is a dark ruby red color with a mixed black berry nose. The berry notes carry through on the palate with plush concentration and velvety tannins. The finish is medium to long with moderate complexity. After the tasting, a bevy of newspaper reports with cameras, and the local television station interviews us, via interpreters, regarding our thoughts on the wine and the region. Later we enjoy a traditional Chinese dinner at this winery seated at a round table with the lazy susan in the middle. Dish after dish of local delicacies arrive, and once again, I am very impressed with the variety of vegetables – spinach, beans, cooked lettuces, mushroom dishes, and many others. Lamb is the specialty of the region, and we have this in the local soup as well as mixed with vegetables. Chicken, beef and fish dishes are also served. During the meal we start with the 2011 Chateau Yuanshi Cabernet Sauvignon which is a much leaner, astringent vintage with strong green pepper notes. Fortunately they switch back to the 2010, which was delightful to pair with the food. The Chinese prefer red wine with their food, and I must say I enjoy the fruity warm tannins of the cabernet with the spicy salty food. It warms up my mouth and my stomach. 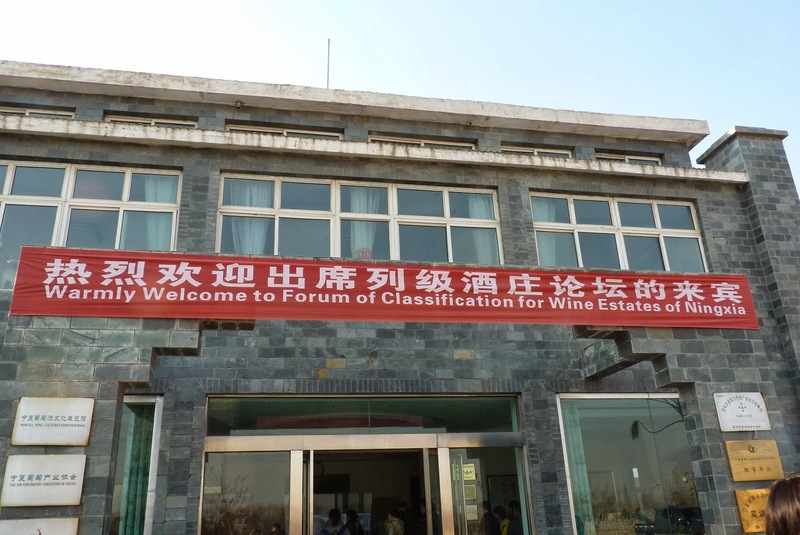 Though they produce a lot of Italian Riesling in Ningxia, it was rarely served with food. We did several “gambei’s” (toasts) with the meal, prompted by the owner. Fortunately she did not expect us to slam back the wine as was required on previous visits. We each sipped from our glasses that were kept filled at a continual 2 ounce pour rate by the served who hovered around the table. A lovely dinner, and a great first day on this trip to Ningxia. 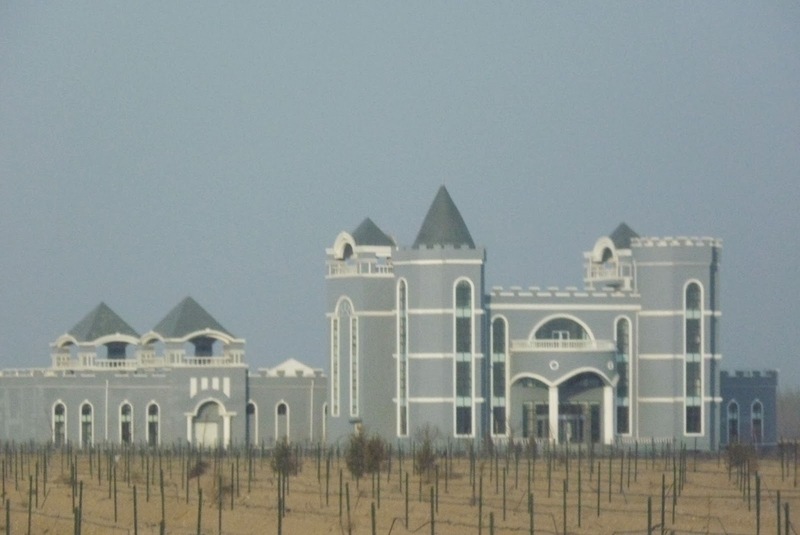 (Dec. 2013) On my second trip to the Ningxia wine region of China, I was able to visit six additional wineries and drive past many others along the new Ningxia wine route. Presently they have 100 different wineries with a lofty goal to reach 1000 in the next decade. What surprised me the most was the different types of architecture used for the wineries. 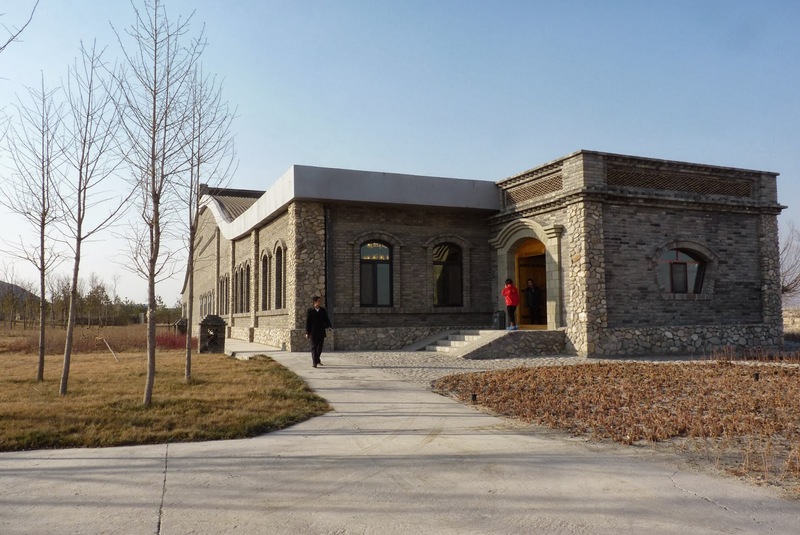 They ranged from traditional and modern Chinese, to French Chateau, Industrial and Urban Ghetto. Quite Fascinating. Following are some photos of these wineries. How Many Wineries Are There in the United Kingdom Now? Though I’ve visited the UK more than 15 times, including a semester abroad at Oxford during my junior year at university, I still haven’t had a chance to visit any of the British wineries. Such a trip is definitely on my bucket list. Believe it or not, there are now 124 wineries in the UK! Joe also provided an excellent commentary on the state of the industry, as well as encouraging news on the number of gold medals British wines have won at recent competitions. When people think of the great wine regions of the world, usually low down on the list, beyond the most well-known and the new world producers, is the United Kingdom. Even in the UK it’s difficult to find home-grown wine in restaurants and supermarkets, which is a great pity, because although the level of production is relatively low, around 4 million bottles a year, some fantastic quality wines are being made consistently. This year’s International Wine Challenge awards saw 4 gold medals for English wines, three of which were sparkling, an area the UK does particularly well in with Ancre Hill Estates’ 2008 Sparkling Wine winning a best in the world award from Italian magazine Euposia. It was even deemed fit for royalty when a Chapel Down white wine was chosen to be served at the 2011 Royal Wedding. With a growing industry and so many great wines to shout about, it seemed there was a need to communicate, in a way that could really grab people’s attention, just how interesting and vibrant the UK wine industry can be. Therefore, I decided the best way to kick off our new Appreciating Wine blog was with an infographic all about UK wine. It takes the form of a map which includes the most significant vineyards, wineries, festivals and shops across the country, as well as some useful statistics and a little bit of history. The London and South East region is at the centre of the industry with its climate and chalky soil making it ideal for Pinot Noir, Chardonnay and Pinot Meunier grapes. In fact West Sussex based Nyetimber recently announced the launch of the UK’s first single vineyard sparkling wine, in a limited edition run of 2,500 bottles. Though the industry remains a niche one, mainly due to the difficulty in producing consistent volume year on year, the high quality of English and Welsh wine is not in doubt. The UK is the fifth largest consumer of wine in the world, but unfortunately only 1% of that is currently home-grown. Perhaps with a little bit more excitement, recognition and cultivation, that number will start to grow. 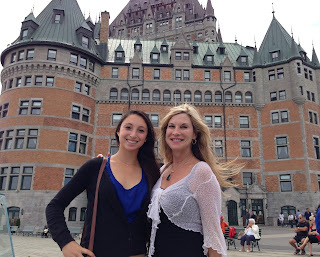 This past week I attended a French Immersion class in Quebec City, Canada and stayed with a local family to insure I was “immersed” in the French language. 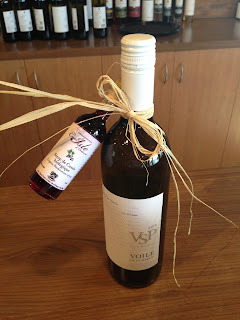 It was a very pleasant experience, and I had the opportunity to visit several wineries and taste wines made from the unique Vandal Cliché grape, which was developed at Laval University in Quebec. There are over 600 wineries in Canada, with the majority clustered in the Niagara Peninsula area of Ontario and the sunny lake region of the Okanagan Valley of British Columbia. 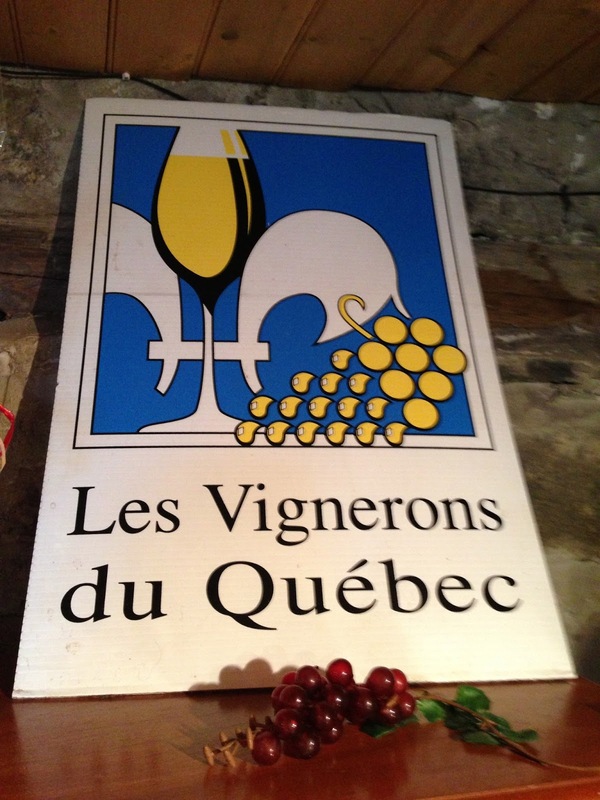 However, Quebec has grown its wine industry over the past 20 years and now can boast over 60 wineries, with 15 of them surrounding the historic Quebec City settled in 1608. As the climate is cold, they primarily grow French-American hybrids. Examples of the white wines include Vidal Blanc – primarily used for ice wine (vin de glace), Syval Blanc, and the exquisite Vandal Cliché grape that is similar to Riesling with a floral nose, and grapefruit and honeysuckle on the palate with a refreshing acidity. I felt in love with this grape while I was visiting. Red wines are primarily made from Marchel Foch, St Croix, Baco Noir and Frontenac. The advantage of these types of varietals is they can withstand the cold snowy winters and the grapevines do not need to be buried as is required with vitus vinifera vines, e.g. chardonnay, merlot, etc. While exploring he found many native grapevines on one of the large islands and name it “Isle de Bacchus.” Later the name was changed to “Isle d’ Orleans.” Cartier attempted to establish a colony, but the cold winters and unfriendly natives scared everyone away. It was’t until 1608 that Samuel de Champlain returned to the area and began to build Quebec City on a high rocky point overlooking the river, which was easy to defend. Over the years they built a wall around the city, and today it is the only walled city in North America. In 1763 France ceded Quebec to the British at the end of the Seven Year’s War, but in 1840 Quebec regained it’s independence when the Province of Canada was formed. Today it still retains much of its French roots, including the French language and cultural similarities. While visiting, I had the opportunity to taste the wines of four different wineries. The first 2 were on the Isle d’Orleans, a15 minute drive from Quebec City, and filled with charming farms selling fresh berries, duck foie gras, cider, crème de cassis, and local vegetables. 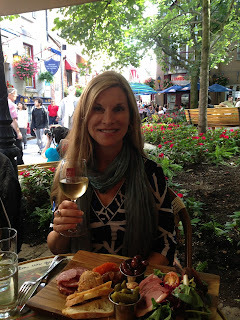 The other 2 were located closer to Montreal, and I tasted the wines in the Farmer’s Market and a restaurant. Vignoble Isle de Bacchus – a small adorable winery with a very friendly tasting room and outdoor restaurant overlooking the vineyards and river. They produce around 50,000 bottles per year (around 4,000 cases), and use 16 different types of hybrids in their winemaking. I arrived just in time to join a $3 guided tasting (in English) of their 7 major wines. Highlights were both of the dry white wines made from the Vandal Cliché grape. The first – the 1535 Isle de Bacchus Dry White 2012 – is fermented in stainless and is a blend of 3 other grapes, including Vidal. It is fresh, fruity with cleansing acidity. Lovely! The second was 100% Vandal Cliché but aged for 6 months in oak – the 1535 Isle de Bacchus Reserve Blanc 2012. The result was more complex wine with a distinct toasty character added to the citron notes. I was also able to order a glass of this at the Lapin Saute Restaurant in Quebec City later in the week. The 2012 Rose of St. Pierre was interesting blend of St. Croix (red grape) and Vidal (white). It had a dusty raspberry nose that carried through on the palate with a crisp acidity. The remainder of the reds was rather sharp on the palate with strong acid and tannins, but I fell in love with their Isle de Bacchus Vidal Blanc 2011 Ice Wine, which had a lovely floral nose, kiwi on the palate, and a very long finish. Vignoble Sainte-Petronille – is a larger winery located only about 5 minutes away from the Isle d’ Bacchus winery. This one also has an outdoor patio where you can buy small snacks and a glass of wine while viewing the vineyards, river, and a waterfall in the distance (Chute de Montmorency). It is a lovely setting. The tasting room reps told me they now have 6 hectares with 17,000 vines, but didn’t have case production information. Here I tasted 8 wines for the very reasonable tasting fee of $3. Again my favorites were the whites made with Vandal Cliché, with the 2011 Voile de la Marine (75% Vandal Cliché) and the 2011 Reserve de Bout de Isle (100% Vandal Cliché); enchanting me with the floral nose and citrus palate. The rose here was bitter and sharp, and the reds followed suite. The 2011 Vandal White Ice Wine, made with Vandal Cliché and Vidal, was stunning, and I immediately bought a bottle. One very clever bit of wine marketing innovation that I discovered here and at the previous winery was attaching a small bottle of crème de cassis to their white wine bottles and selling it as a “kir.” In France, a kir is quite popular, and is simply white wine with the addition of cassis liquor. It creates a charming, pink, slightly sweet drink that is excellent on a hot day. Since there are so many black currant bushes that grow wild here and many farms that make crème de cassis, this marriage is obvious, but also very clever from a marketing perspective. Perhaps we should consider attaching a small bottle of different flavors to our wine bottles in the US in order to create more consumer interest – just as the vodka companies have added flavor to their vodkas. 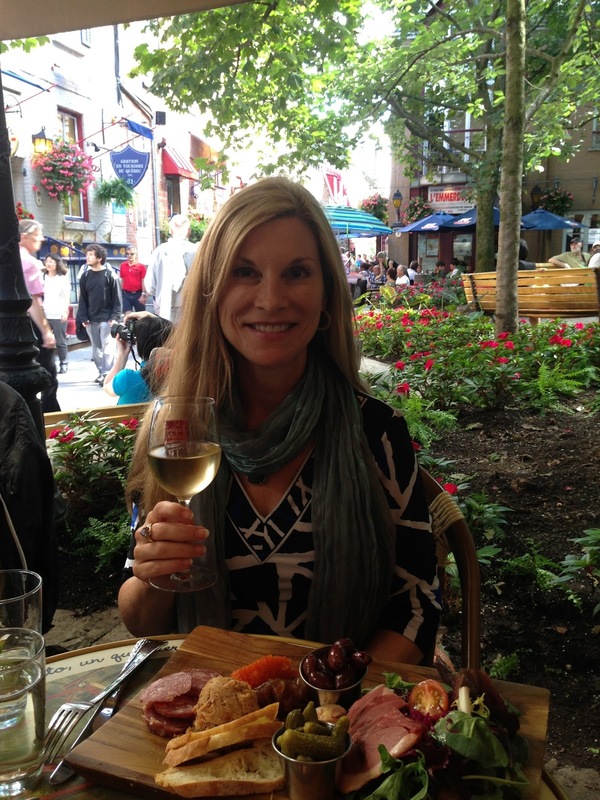 Domaine de Lavoie – I was able to taste the wines of this domaine in the Farmer’s Market in downtown Quebec City on the port. It is open from 9am to 5pm every day in the summer and is a delight to attend with all of its local products. This winery is located closer to Montreal, and also produces cider. I tasted 6 wines with no tasting fee, and found the quality to be at varying levels. There was no Vandal Cliché here, but the 2012 Seyval I tasted was lovely, and the 2011 Vidal Ice Wine was exquisite. 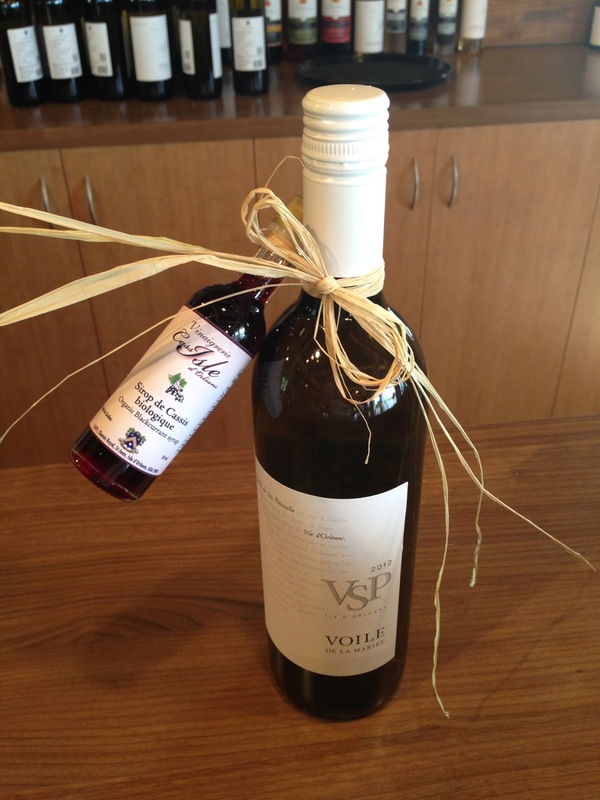 No one can do Vidal Ice Wine as well as Canada! Riviere Du Chene – I only tasted one wine, the 2012 Le Rose Gabrielle, from this winery but it was a very positive experience, because it was the best Quebec rose I had. The wine was featured by the owner of La Pizzaoi Restaurant, who told me that he had personally selected it because he was impressed with the quality. They also offer a red and white wine from the winery. The rose was fruity and refreshing with a raspberry nose and more complex berry on the palate with some citrone. Very refreshing. Altogether I would say that the Quebec wine industry has found a new star in the Vandal Cliché grape and they should consider publicizing it more. Also their Vidal Blanc ice wines are wonderful, but most of the world already knows that Canada produces lovely vin de glaces. In general, the local specialties of the area include: foie gras, caribou stew, Quebec venison pie, and salmon with maple syrup. In addition there are some interesting local cheeses, and many dishes with fresh berries. 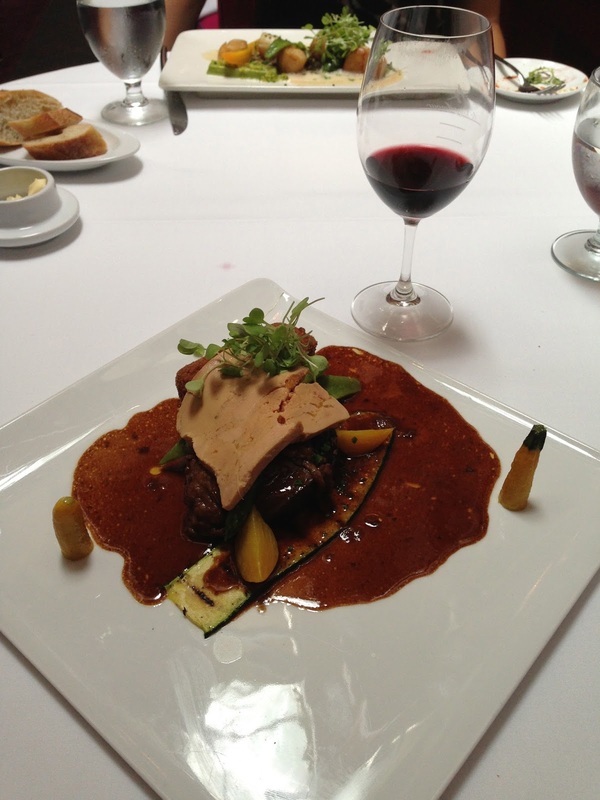 #1 Le Saint-Amour – expensive, but if you go here for lunch it is only around $25 for 3 courses. 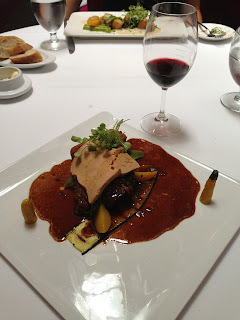 Beautiful French food with a Quebec flair and perfect, friendly service. A recommendation from our local family as the best place to eat in town. #2 La Pizzaoi – the most amazing and creative thin crust pizzas I’ve ever eaten. A cute little restaurant with indoor and outdoor tables. Not fancy, but excellent with a very friendly owner who explained how he developed his unique recipe. #3 Graffiti – outside the old city on the Rue Cartier, a famous shopping street with many charming restaurants. Excellent food and wine list. Nice décor with outdoor seating. #4 – Lapin Saute – probably the prettiest restaurant in Quebec City, and definitely a tourist trap, but still very charming with tiny tables in a garden. Looks like a fairytale setting. I ordered the rabbit, duck, and foie gras plate, which was delicious. #5 – La Gallette – a Lebanese take-out place hidden amongst the flashy Grand Allee bars and restaurants. It looks like a dive from the outside but for $7.75 you can have an incredible “Lebanese burrito” with fresh ingredients and incredible spices that will fill you up for most of the day. Delicious and messy! #6 Bistro Bissou – the friendliest service we found and decent food for a decent price. On Rue St. Joseph outside of the old city. Consider the daily lunch special for only $11.50. #7 Les Ancêtres – on the Isle d’Orleans has one of the best sunset views around and overlooks the St. Laurent river. Though the service is iffy, the food is beautifully presented with local herbs and edible flowers. In general, Quebec City restaurants do a good job at offering at least one local wine on their wine lists. This made me happy, because one of my pet peeves is restaurants that do not feature local wines. Indeed at Lapin Saute, when they did not have the local rose they advertised on the menu, they opened a bottle of Vandal Cliché and poured me a glass for a very decent price. Now that is good service, and very supportive of the local wine industry. I should mention the very high tax rate of 15% that shocked me when I received my first few bills. This coupled with an expected tip rate of 15% on top of the tax rate, can make your meal much more expensive that it first appears on the menu. Food and wine prices, in general, are similar to the US, but the additional tax rate makes it seem much higher. 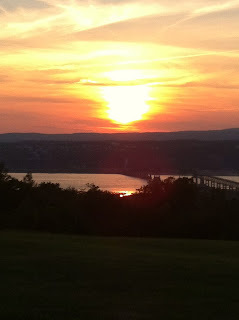 There is plenty to do around Quebec City. Some of the highlights include just wandering the streets of both the high and low part of town to see the historic architecture, old walls, winding streets, and colorful shops and restaurants. Horse drawn carriages give it an air of by-gone days, and you feel as if you are in a European city. There are several museums, and this summer is the last time the Cirque du Soleil will do its free shows. We had the opportunity to see one, and it was fabulous. Close by are the battlegrounds in the Plains of Abraham park with the old British citadelle and the Joan of Arc garden. Fun sections of town outside the old city include the Grand Allee, Rue Cartier, and the Rue Joseph districts. We drove the 15 minutes to see the famous waterfall called the Chutes de Montmorency, which was worthwhile, and a great workout climbing up and down the steps. We also spend a whole day exploring the Isle of Orleans, which I think was one of my favorite places with all of its charming farms with old barns painted white and red. There are many places to stop and taste wine, cider, crème de cassis, local jams, fruits, and foie gras. A truly enchanted island. (June 2013) - We arrived at the aging cellars of Henriques & Henriques Winery around 12:30 and spent a delightful two hours exploring the barrel rooms and tasting more than 20 amazing Madeira wines. Though the still wine is fermented elsewhere on the island, the historic cellars are located in Camara de Lobos, a suburb of Funchal near the ocean. Currently the 3rd largest producer on the island, and the only winery to own 11.5 hectares of vineyards (28.6 acres), Henriques & Henriques was founded in 1850 by Joao Joachim Henriques, but today is co-owned by CEO Humberto Jardim and partners from France. Paulo introduced Lupe and me to Humberto, who toured us through the winery and regaled us with fascinating tales of history and his long friendship with John Cossart, the very illustrious winemaker who passed away in 2008. We were impressed with the innovative processes being implementing in the various barrel rooms where the Madeira is aged for 5, 10, and 15 years as well as at least 20 years for vintage wines. Humberto has developed a method to recycle and re-condition barrels so they can be re-used. He has also entered into an innovative partnership with America whiskey producers in which they trade barrels in order to obtain new flavor profiles for the Madeira and the whiskey. Later, during the tasting, we were able to taste a Madeira that had been aged in an American whiskey barrel, and there was a distinct smoky flavor in the wine. Humberto is also experimenting with barrels made of Spanish oak. We were enthralled with the multiple rooms of aging Madeira under the “canteiro system,” in which the wine is aged in old barrels (usually 700 liters, but some also much larger in French foudres) in rooms that are heated by the sun. The wine in the barrels is usually not topped, and therefore allowed to oxidize in order to achieve the distinctive nutty dried fruit notes of a classic Madeira. Humberto reported that his evaporation rate ranges from 1.5% to 7% depending on the location in the cellar and size of barrel. • Sercial is an excellent aperitif on a hot day, where its searing acidity can wash away fatigue. Generally 49 – 65 grams per liter residual sugar. • Verdelho is bolder and makes a good pairing with fish. Generally 65 – 80 grams per liter residual sugar. • Boal is like an English tea where you can have it with cakes and sandwiches. Generally 80 – 96 grams per liter residual sugar. We were also informed that Boal is known as “Malvasia Fino” in Portugal. • Malvasia (they prefer not to use the British word “Malmsey”) is a perfect dessert on its own, but can also work magically with custards and creamy based desserts. Generally 96 – 120 grams per liter residual sugar. For the tasting, Humberto escorted us to the technical tasting room next to the lab, so we were able to watch some of the workers analyze the wine as we enjoyed more than twenty different Madeiras. He explained that the best Madeiras are like a perfectly balanced triangle of sugar, alcohol, and acidity. Nothing should stick out, but all three should work together in harmony. • 2000 Vintage H&H Boal – toffee, carmel, salt, yum! Wines which I found a bit unusual, but worth mentioning were: a 20 year old H&H Terrantez with the distinctive spiciness that comes with that rare grape varietal; a 1954 H&H Terrantez of oily texture with molasses and metal notes; and a 1957 H&H Boal that had been fermented with stems and showed amazing texture and weight on the palate with crisp acidity. I was impressed with the memorable labels of Henriques & Henriques wines with their distinctive H&H symbol highlighted in a box, and color coded to match the different wine levels, such as generic (3 years of age), 5 year, 10 year and 15 year. Very easy for consumers to spot on a store shelf and easy to remember – however perhaps a tad tall for distributor’s tastes, I was told. Colheita and Vintage wines are wisely sold in the traditional dark Madeira bottle with the white stencil letters. We ended our tour in the large public tasting room, and I was interested to see how they were set up for tourists with a large open floor plan, tasteful displays, a tasting sample station when you enter, and state of the art cashier and checkout counter. June 2013 - Our appointment to visit Barbeito Winery was scheduled for 10:30am, and Paulo drove his SUV expertly around the many twists and turns on the narrow road to the hilltop location. The CEO and winemaker, Ricardo, greeted us and we started the tour at the grape reception platform. As the tour progressed, we became more and more impressed with Ricardo’s energy, passion, and innovative spirit. Barbeito produces around 170,000 liters of wine per year (around 19,000 cases), including a variety of third-party labels such as the famous Historic Series. Ricardo said they purchase all of their grapes from local farmers with an ideal brix of 17 (quite low! ), but needed to achieve the fresh acidity for which Madeira is known. For the Tinta Negra Mole (making up 85% of the island’s production), Ricardo destems and crushes lightly, and then will often ferment in temperature controlled stainless steel tanks outfitted with robotic lagares – one of his innovations. Interestingly the ancient method of making Madeira was to trod by food (lagares) in the same method that port is made. If needed for coloring or palate feel, carmel may be added after fermentation when the wine is fortified. However, it should be noted that the carmel is not for flavor, but more to achieve a desired color which consumers prefer. 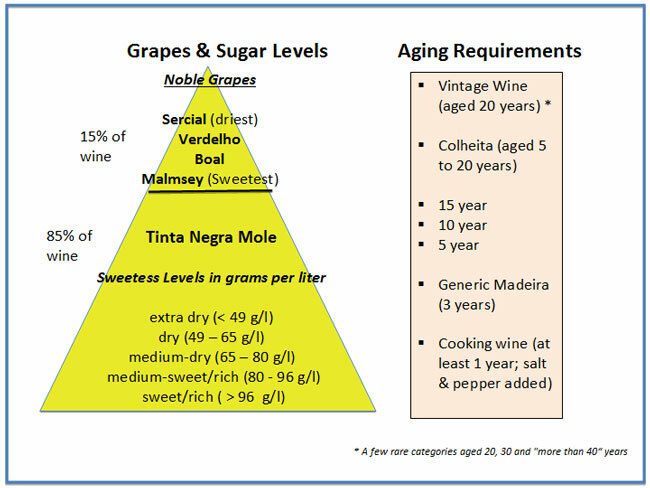 By law, generic Madeira (made with Tinta Negra Mole) must be aged a minimum of 3 years. For this less expensive type of wine, the estufa method is generally employed. 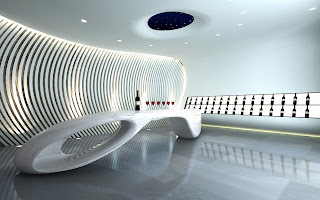 Here the fermented wine is fortified with alcohol to 17.5 – 22%, and then placed in large stainless steel tanks with hot water circulating around the wine to heat it to 47 – 52 degrees Celsius for a minimum of 3 months. It is then aged in either tank or large wooden neutral barrels for an additional 2 years before it is blending and bottled for sale. Higher quality Tinta Negra Mole and wines made of the 4 white noble grapes, often go through the more expensive canteiro method. Here the freshly fermented wine is fortified and then placed into large 700 liter neutral barrels in a heated room for 5, 10, 15 years, and/or 20+ years for vintage wines. By law, wines labeled Colheito must aged 5 to 20 years. There are also some 30 and even 40-year-old Madeiras. Ricardo pointed out the unique zinc-covered cement ceilings in his canterio aging room, as well as the large windows that he opens at night to cool the room. He explained this helps to slow down the sugar and allow the acidity to balance the wine. His viewpoint is that a room that is always hot is not as good for the wine, and that natural cooling at night is more similar to the ancient sea voyages that helped to create the original Madeira’s. Overall, he reported that his average evaporation rate is 3 to 8%, depending in which of his 5 aging facilities the wine is stored. Ricardo and his staff taste through the wines in order to determine which ones will be labeled generic, 5, 10, or 15 years. For Colheito and Vintage wines, there are only declared in very good years. After the wine has aged according to the desired number of years for the label, it is blended. By law up to 15% of another grape varietal can be blended, so many of the wines labeled as noble grapes, e.g. Sercial, often have some Tinta Negra Mole added. This is because Tinta Negra is much easier to grow and provides good flavors. Ricardo said he currently has around 33 different blends. We visited the small demonstration vineyard Ricardo has planted of Serical and Verdelho vines. He is experimenting with VSP trellis and cane pruning, but has come to the conclusion that the traditional high pergola method actually works better for these grape varieties. We began our tasting with a tank sample of 2012 Tinta Negra. I was surprised at the light rose color, and the fresh fruity characteristics of the wine. Next we tried a tank sample that had gone through the mechanical lagares method, and found it to be deeper colored with more tannins and berry flavors due to the more intense extraction. We also tried a 2012 Malvasia, which he had fermented partially with stems. It was much more intensely flavors with a textured mouthfeel. We then tasted through a variety of vintage wines ranging from 1988, 1992, 1996, 1997, and 2001. My favorites of the tasting were the Barbeito 1992 Sercial, 2001 Malvasia, and a Barbeito 20-year-old Malvasia.